The exceptional master planned community of Brunswick Forest is nestled perfectly just minutes from Historic Downtown Wilmington, NC. The Brunswick Forest community offers excellent real estate opportunities in an unsurpassed location. A temperate climate, prime location and one-of-a-kind lifestyle are only a few of the reasons that so many have chosen to call the coastal community of Brunswick Forest home. Low maintenance town home living is a smart choice for those looking for a single level home with just the right amount of space. Brunswick Forest offers several town home designs that feature spacious master suites, guest bedrooms, and gourmet kitchens. Enjoy lavish exterior must-haves like screened in porches and lanai’s to take in the beautiful North Carolina climate. 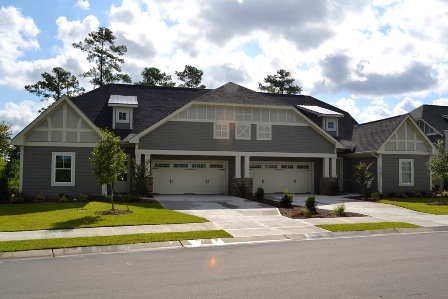 Stylish and easy living is all attainable in the town homes of Brunswick Forest! With convenient access to all of the community’s amenities and just steps away from multiple parks and walking trails life is enjoyable at every turn. Benefit from lock and leave capabilities and lawn care maintenance in these extraordinary town homes. Enjoy life in Brunswick Forest with minimal responsibility while taking full advantage of the outstanding Brunswick Forest lifestyle. For more information, please call 888.371.2434.